All the years of dreaming and planning came down to this moment. There were no nerves, no jitters. A quick “I love you” and he was off. At 8:53 a.m. on March 15, 2018, he began to live his dream. We arrived in Georgia a day earlier than we anticipated. A winter storm was heading toward the Northeast and it was unlikely we’d be able to get out of Connecticut on Tuesday, March 13, as planned. The airline was allowing no-cost changes to get out ahead of the storm. We did some quick last-minute preparations and packing and off to the airport we went. We overnighted in Atlanta before heading to Amicalola Falls Lodge, as planned, the next day. We were the recipients of some great trail magic at the hotel in Atlanta from a hiker who was getting off the trail. Shout-out to our hotel shuttle driver and the rep from Dollar Car Rental for the excellent service. Driving into Dawsonville we caught our first glimpse of the mountains. Gulp. What a moment. We were finally here. The Amicalola Falls Lodge is beautiful and the views breathtaking. We were told our room wouldn’t be ready until 4 p.m. (check-in time) and had heard the restaurant was subpar so we decided to head back to town for lunch. Side note: the Maple Restaurant has heard the negative reviews and has made some positive changes. We enjoyed the buffet breakfast, and the soup and salad bar option for dinner (only $8) was excellent. We stopped in the visitors center before heading back into town. 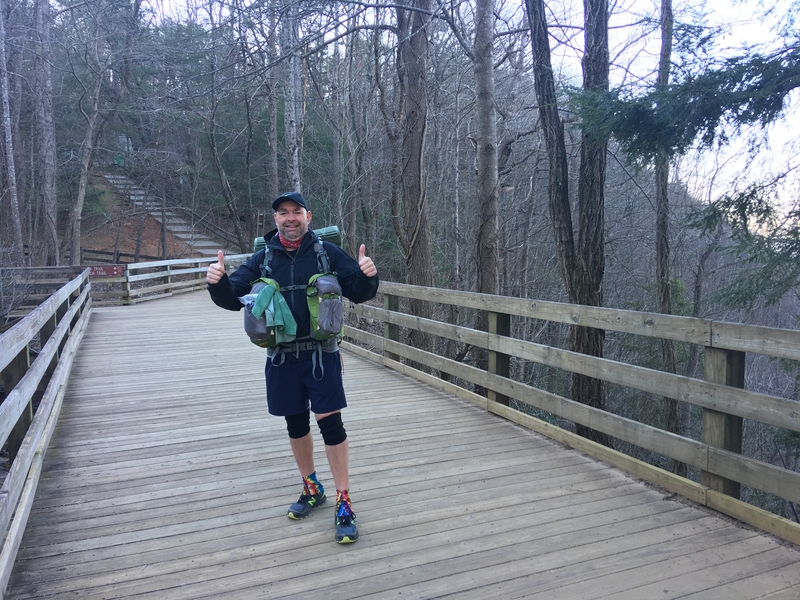 There we met with Bob from the ATC and Ray officially registered as a 2018 Appalachian Trail thru-hiker, #993. Aspiring thru-hikers are encouraged to attend a brief workshop offered daily at 9 a.m. and 4 p.m. The ATC staff reviews important safety and precautionary points. Bob was kind enough to give us a one-on-one session and covered such topics as Leave No Trace, water, shelter, food, gear and clothing, and pack weight. Essentially, the ATC wants to be sure all hikers are prepared. This early season has brought below average temperatures and significant rain. Several hikers were getting off the trail within days of their start because of the cold temps. The ATC staff also offers the opportunity for a gear shakedown. They will go through a hiker’s pack with them to consider what items may be unnecessary and how to shed some pack weight. Suggestions for the hiker in front of us included removing a couple of days of food (he was carrying about seven days and it is only three days to the first resupply), a hatchet, and a few other weighty items. These items were left in a hiker box. Following our talk with Bob, we walked to the back of the building where we saw, for the first time in person, the famous arch that marks the beginning of the approach trail to the Appalachian Trail. Again, a surreal moment. Ray talked about how for so many years there were obstacles and milestones that stood between him and this arch – double shifts, bills to pay, selling the house, retirement. It seemed that there was so much that had to happen before this day would come. At times it seemed it never would. But now that day was here. At the ranger station heading out of the park, we asked for a good place to grab a beer and wings. We were directed to Dahlonega rather than back to Dawsonville. Good call. Dahlonega is home to the University of North Georgia. We enjoyed walking the campus and visiting several of the shops in town. We stopped by Outlaw Jerky and Trail Grub. Yum! So much to choose from (and they do mail orders). The Woodland’s Edge is a great stop for gear and trail supplies. The owner was playing John Denver in the store so I was in no hurry to leave. There are lots of dining options in town, from an Irish pub to Mexican cuisine to pizza and more. The shillelagh sandwich and the fish and chips at Shenanigans are excellent. This is all well and good for Ray because he was getting ready to walk 2,200 miles. Me? I’ll need to stick to the salad aisle when I get home. We enjoyed our time at the lodge and met several others hikers. We met a couple from Maine, Tim and Terry, who know my family in Maine (small world). Tim was heading out that morning. Poppy was getting ready to begin her journey with her parents there to cheer her on. And we saw a group from Warrior Expeditions taking pictures under the arch before they headed out on their trek. Beautiful moment and we thank each of them for their service. And then it was finally his turn. Ray was so calm the morning he stepped off. No jitters, no nerves. He was at peace, he said. I, on the other hand, couldn’t seem to take a full breath. The sky was bright and blue but I would have worn my sunglasses even if it was raining. I kept telling him, “I’m not sad!” and I really wasn’t! I felt such pride, such gratitude, such love. We talked for a moment, hugged, and said our goodbyes – then I grabbed the camera and captured the moment when he lived his dream. I sat in the car for a good 20 minutes after he left, you know, just in case he changed his mind. OneFoot finally puts his two feet on the trail. This adventure has already brought such blessings in ways we didn’t imagine. We’ve connected (and, in some cases, reconnected) with family and friends. 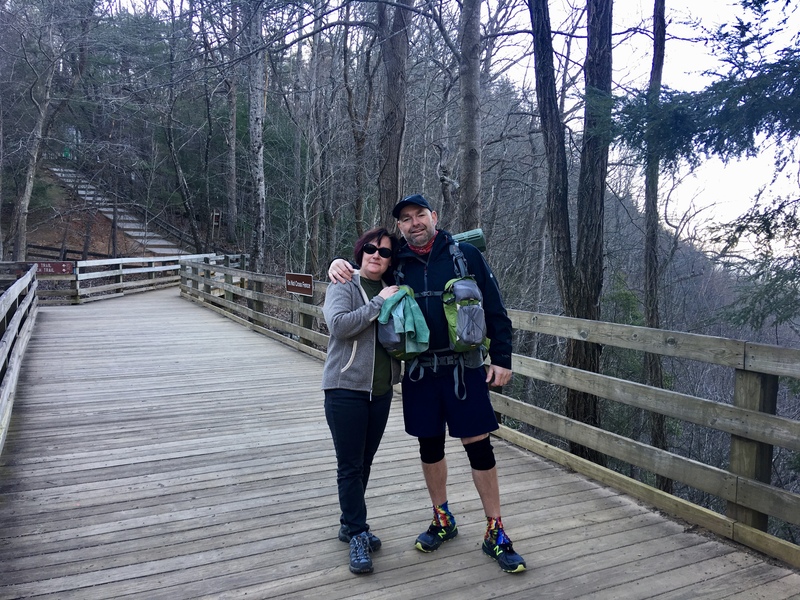 People who have never heard of the Appalachian Trail have become interested in OneFoot’s journey. Some are reading about the trail and hiking and asking questions. It’s a great opportunity to introduce folks to this world and bring others along on this trek. Soon I’ll start receiving updates from OneFoot and we look forward to sharing with those reading our blog. Life at home is going well. I walked into the grocery store yesterday morning and they were playing Bruce Springsteen’s “Working on a Dream.” I couldn’t stop smiling. It’s the ringtone on my phone for Ray. When I got home from Georgia, the house was dark and quiet. I put my bag down and felt a little twinge of loneliness. Just then my phone rang – cue the music – “I’m working on a dream.” It was Ray, calling from his hammock. Life is good. I may have called him Gary (after former Bruin player Gary Galli) but don’t think I don’t know who you are, One Foot, I’ll be following along all the way to Katahdin! Sam, you are TOTALLY forgiven for calling him Gary – given that you confused him with a Bruin. When we met, I was a Whaler fan and he was a Bruin fan. The Whalers moved out of CT and I migrated to the Bruins…and thought my boyfriend had an amazing resemblance to Ray Bourque, eyebrow and all! OneFoot is doing great and has fallen in love with trail life. You remember well, I’m sure. I’m so excited for him! Nice story, great writing. I look forward to more. Your support for your husband is awesome. You’re quite a team. I’m 53 years old so relate to Onefoot. I hope my turn will come one day to thruhike the AT. Meanwhile, I will follow his progress closely. Cheryl, thank you for sharing the experience.